Ray Caye Island Resort offers a unique vacation alternative to the hustle and bustle of Belize’s larger island and mainland beach destinations. Our Private Island, off the coast of Placencia in Belize, caters to travelers who are looking for an exotic and fun vacation that is also authentic and natural. 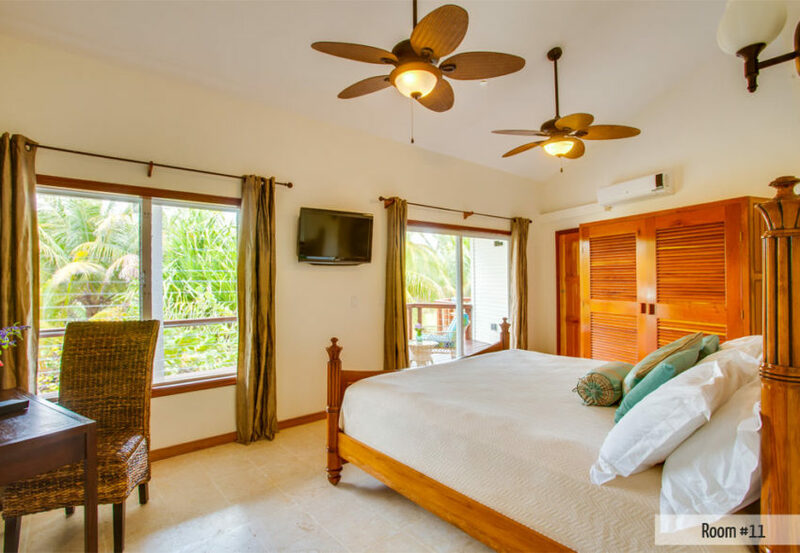 Our island resort has everything you’ll need and more to ensure a great time at Ray Caye whether it’s for a day or a week. Contact us to learn more about spending your vacation on your own private island. Located on the edge of the Gladden Spit and Silk Cayes Marine Reserve in Belize, Ray Caye is literally a stones throw away from the Belize Barrier Reef making it an ideal location for world class fishing and diving trips. Loinfish Bar- The bar is open from 7am until as late as you like. We’ve found that guests don’t want the nights to end! There is a delightful array of juices, soft drinks, cocktails, beers and wines for you to choose from. Spacious room furnished with one queen-sized bed. Families or couples traveling together can rent this cabana along with the adjoining one. Both units have their own deck and entrance but the interior connecting door can be opened to create a large common area. Spacious room furnished with two queen-sized beds. Families or couples traveling together can rent this cabana along with the adjoining one. In our oceanfront cabanas, you’ll experience the tranquility and luxury of being on a secluded island in Belize. As you immerse yourself in swaying palm trees, crystal clear water and sunshine, your cares will slip away. Private, king bed cabana for those special days away together. Set apart from the others for the ultimate romantic get away. Comfortable rooms furnished with one queen-sized bed. Rooms #8 and #9 are located on the 1st floor of the Mainhouse. 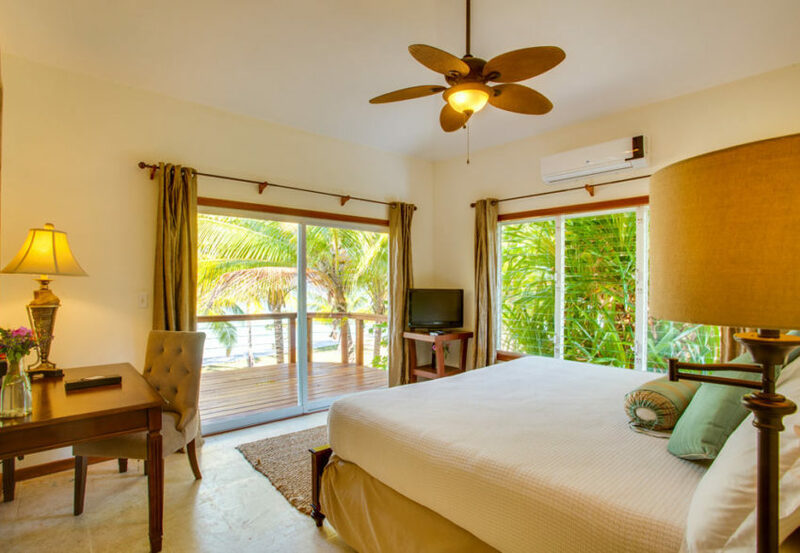 These rooms have a private decks with a view of the sparkling Caribbean Sea. After a long day of adventure you can come back to your room and enjoy the air conditioning or WiFi while you relax in comfort and elegance. Room #10 is furnished with one king bed. This rooms has its own private deck with a full ocean view. 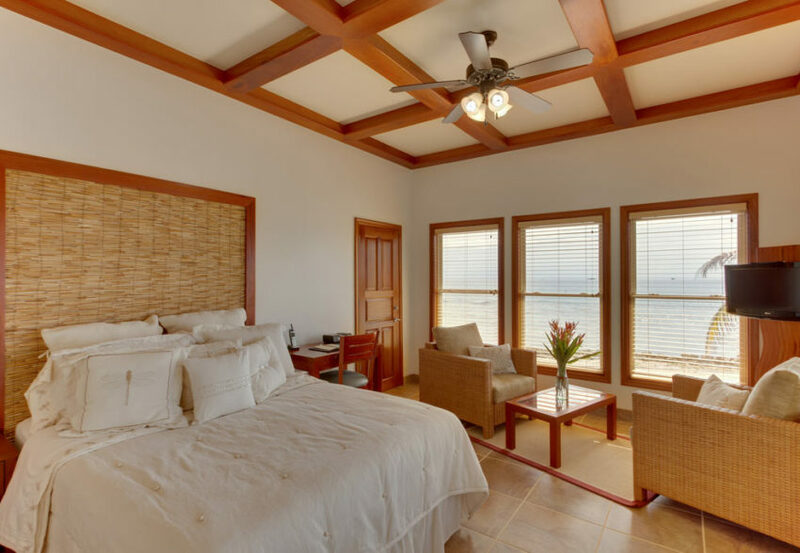 Relax comfortably after a day of fun on the sea in your Belize Oceanview room with the A/C on, the ceiling fan stirring the air as you catch up with your friends on our free WiFi. 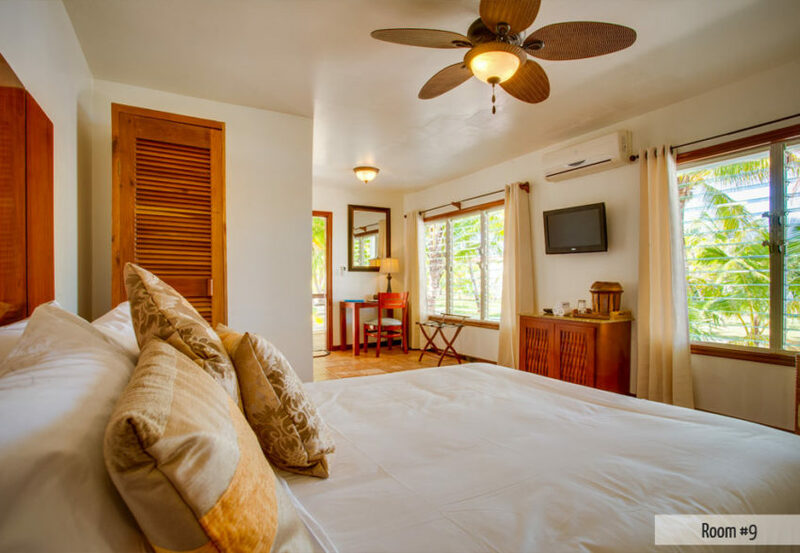 Comfortable, elegant rooms furnished with one king (#11) or two queen-sized beds (#12). These rooms have their own private decks, with partial ocean views. Enjoy A/C, ceiling fan, and free WiFi. Room #11 also comes with an in-room safe and both rooms come with a DVD player. These rooms have a connecting door and can be combined as a two-bedroom unit. See details below. 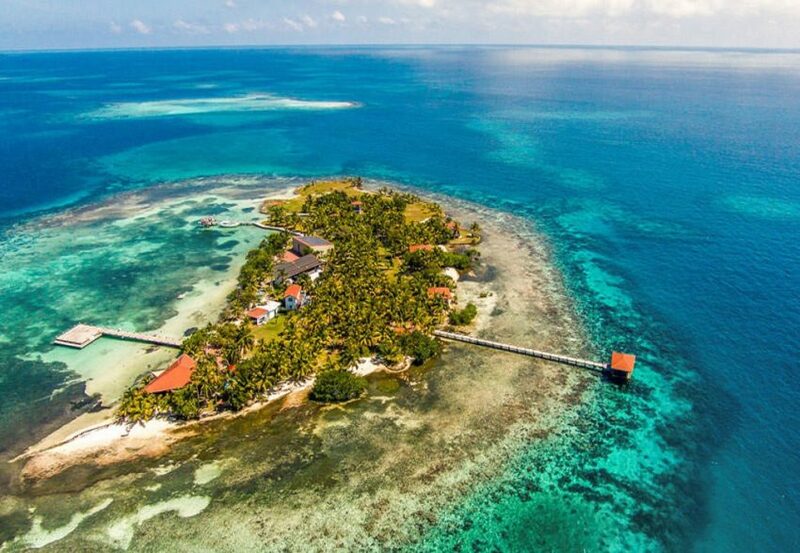 Renting a Belize private island is not just for celebrities anymore! Ray Caye makes it possible for any group of people seeking an exotic, unique and exciting vacation to get exactly what they are looking for. 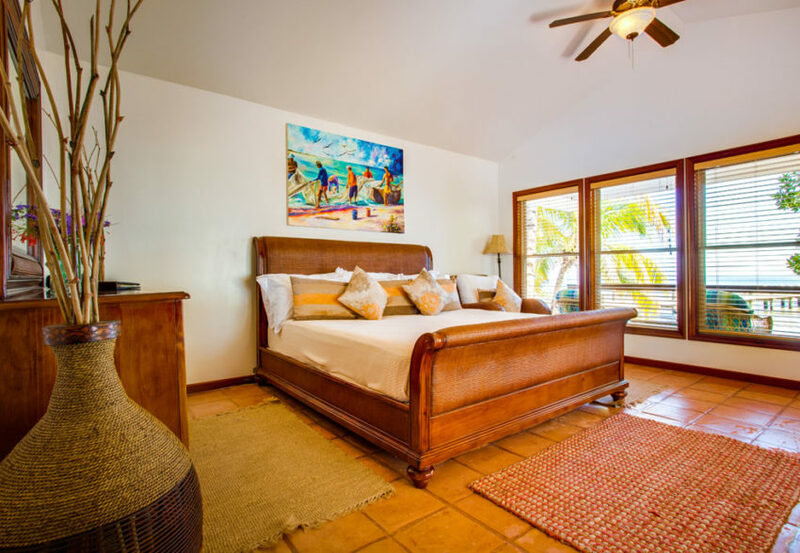 Whether you are looking for a romantic island atmosphere for a wedding party or an adventurous location for a dive group, Ray Caye is ready to accommodate you on our Belize private island. The island can accommodate up to 30+ people* and features many island activities and reef tours to keep everyone active when they’re not lounging on the beach or poolside. There is also a full-service restaurant & bar on-site that offers a unique and tasty menu of fresh seafood and local produce. Want to have Ray Caye all to yourself? Find out how on the Private Island Rental Package page or contact us anytime! ADD ON: Daily meal price per person is $98 and Drink package per person is $55. Round trip boat transfer price per person $80.